The Senior Scholarship Exhibition’s doors are open to the public. It is a day dedicated to celebrating visual arts education and honoring artistic excellence. The IHSAE has scheduled a variety of art related activities throughout the day for our students, their families and guests of the show. Blick Art Materials will be on site to showcase the latest in art materials and provide free giveaways. The studio doors of many Bridgeport Art Center artist’s will be open throughout the building. Stop in and visit with these amazing professional artists. Arrive early and stay late to meet with admissions representatives from local, state and nationally recognized art schools, colleges and universities to discuss potential scholarship offers. The exhibition and awards presentation will be held at the Bridgeport Art Center on Sunday, February 24, 2019. The awards ceremony is meant to recognize all the students who were offered a college scholarship and selected for exhibition. Students who are not in attendance will forfeit their IHSAE award(s). 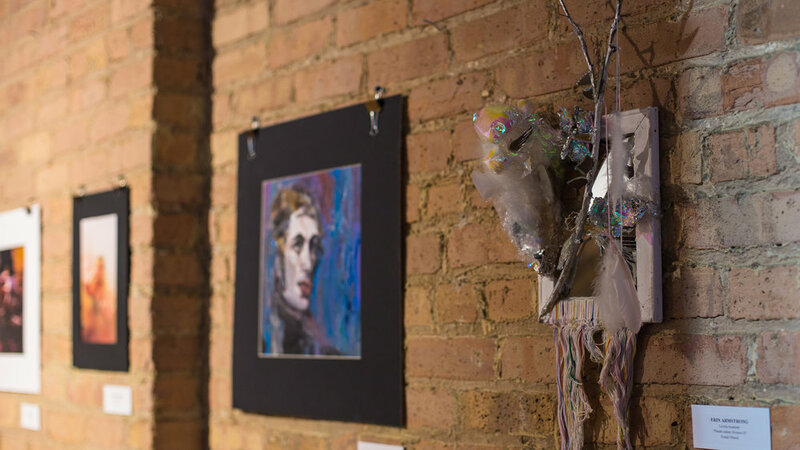 Artwork that has been chosen to receive an IHSAE award will have an identifying label placed on it, so students will be aware their work has been selected for an award. Students with provisional scholarship offers will be recognized on stage during the awards ceremony. Reminder: All scholarship offers are considered provisional until the student has completed a formal application and been accepted to the offering school. Student attendance is required for all IHSAE awards to be claimed. Students who are not in attendance, will forfeit their IHSAE award(s).